I saw this game advertised on Breakfast Television this morning and I thought I would share it with you. 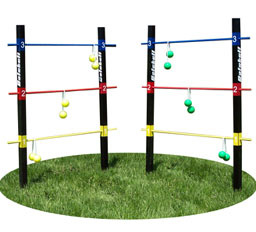 I’m a huge fan of these simple outdoor games. They are easy to play, bring friends and family together, and fun! The basic idea is similar to Bocce Ball or Horseshoes. Two targets are setup 25ft from each other. The targets are made of 3 levels of coloured doweling. Players are given 1 set of coloured bolas each. The bolas are made of super rubber balls attached by rope. The players must throw from one end of the playing field without crossing the plane of the target and try to have their bola wrap around one of the 3 levels. Players alternate shots for a possibility to knock an opponent’s bola off the level. The top level is worth 3 points the middle level is worth 2 points and the bottom level is worth 1 point. The first player to get 21 points without going over wins the game. If the player does go over 21 the points scored on that round will be subtracted from the score prior to throwing. The advantage of this game over Bocce Ball or Horseshoes is that it is far less dangerous. The bolas are lightweight, meaning smaller children can throw them and if a throw goes awry it is less likely to cause damage.